→How Many Miles Can You Walk In A Day? Find Out! Walking especially brisk walking is one good way to keep fit without going to the gym or doing other intense exercises. If you are an avid walker, you may be wondering how far is too far? 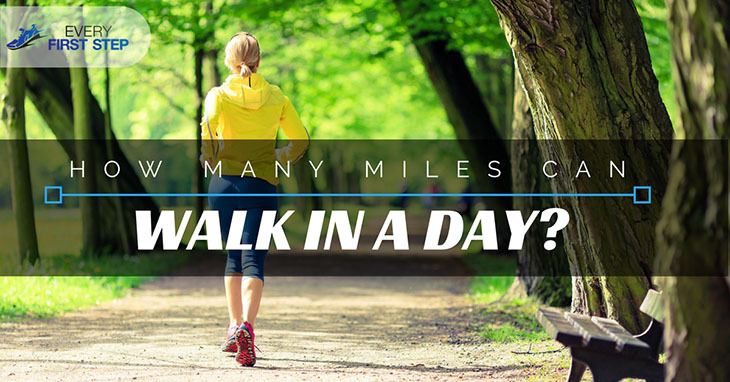 How many miles can you walk in a day? Of course, there is no final answer, and it greatly depends on the fitness level of a person, there is an average number of miles that one with reasonable fitness can walk each day. In this article, we will discuss how far you can walk in a day, some dangers of walking too far and how you can build mileage. If a person brings water on their walk, they are more likely to endure a longer period that someone who doesn’t have any water. Taking food on the hike is another factor that may lengthen the time walked. Walking when there is the favorable weather is easier than walking in the extreme heat or cold. Obviously, the temperate outdoors when walking is something else that can affect the number of miles walked in a day. On the other hand, trained walkers such as those who enter marathons are able to do 26.2 miles of the Portland marathon without breaks in 7 hours. (4) With breaks and meal stop, 20 miles a day for a trained walker is feasible. If they were walking fast without breaks, then they could even do 30 miles. In another popular trail - the Camino de Santiago, walk on average 10 to 17 miles per day on a terrain that even has some hills. Using a pedometer, try and reach at least 10,000 steps a day before stepping up your walking. You can do this by being more active and doing things such as taking the steps instead of the elevator. If you are still a newbie, just walk at a pace that allows you to talk, not gasp for air but still is fast enough to make you sweat. When considering walking for a longer distance, only increase your distance by 10% of the previous week. If you stop for a week or so, then start back at a lower level and build up again. For example, do walking lunges, lift kicks, double toe raises. Remember that in order to get better endurance, you need first to build your muscles. There cannot be a fixed number when it comes to how many miles you can walk in a day. The bottom line is there are so many factors to consider when it comes to estimating how many miles you can walk. ​Whatever your situation, you can always increase your mileage by training your body. Remember that it is never too late to become a seasoned runner. How did you enjoy this article? How many miles is your current record? We’d love to hear more about your walking experience in the comments below. Please also feel free to share this article with others.